A red Fiat is parked in the courtyard of MERCI concept shop (trending fashion, art, furnishings...) in the Haut-Marais, with its book-lined tea room for light lunches. That enormous revered forest mushroom, the cèpe, is back in season, and crates of them can be spotted in nearly every market. On any given Sunday look for this bizarre vehicle on the streets of the Marais, propelled by its proud inventor. Artist Pierre-Auguste Renoir lived and worked here, the oldest house in Montmartre that dates from the 17th century, now a museum. Only recently were the gardens opened to the public. Not far from the Opéra a bakery offers freshly made sandwiches, viennoiseries, coffee to go and macarons beautifully set out in glass containers. Partial view of gardens at the Carnavalet Museum, once residence to the Marquise de Sévigné whose letters inspired the novel, Les Liaisons Dangereuses. Early morning rooftops from a terrace facing west. Wafts of freshly baking croissants pierce the air. A man takes a break at the fountain in the Palais-Royal gardens. Fall brings with it a new crop of plays, and Paris theaters, such as this one on a side street in Montparnasse, are alive and thriving. Ducks take a late afternoon dip along the quais of the river. Partial view of façade of Église Saint-Germain-l'Auxerrois, church to kings of France when the Palais du Louvre was the royal residence. Below, detail of a statue and portal. At first glance this eye-catching window display looks as if it's a gallery, not an eyewear shop. A locked gate overlooks a section of métro track that runs above ground. Warm September evenings invite stopping for a drink-&-chat in the bustling quartier of Old Belleville. Coming out of a métro exit near Sorbonne University in the Latin Quarter I turned around and got this shot. Local wine bars and wine restaurants are the surest places to find share-worthy combo cheese and charcuterie plates and planches. Country bread, butter from Isigny and a crisp Bandol rosé rounded this one out. Top photo: A painting of a couple, both poets, peering out a window from their grave in a small Montmartre cemetery where mostly lesser known artists, writers and musicians repose. A deserted tomb with no descendants to care for it stands amid more modern graves. The cemetery is built on a slope. Grave of Dr. David Gruby, private physician to Vincent Van Gogh and his brother Theo when they lived in Montmartre. Frédéric Chopin, George Sand, Honoré de Balzac, Alexandre Dumas and Franz Liszt were also his patients. 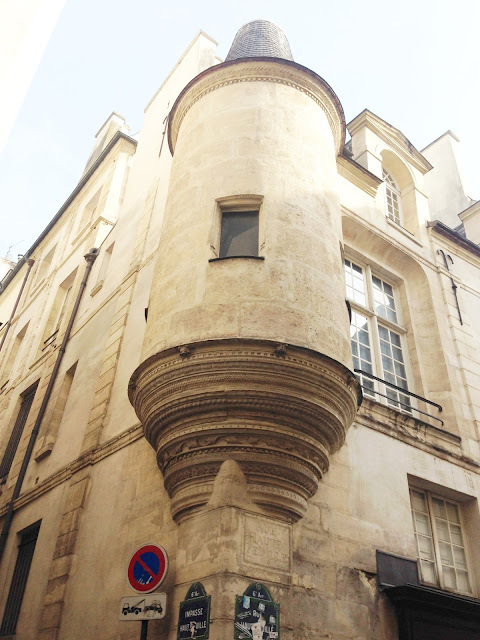 Turrets on the corners of buildings are a common architectural feature in areas of the city that Haussmann didn't get to. The fall collections are hardly in and already these spat-like shoes by Chanel are being spotted at some of the most branché addresses around town. A woman walks her dog past a lovely old building defaced by tags. No sooner does the city get it cleaned off more seem to appear on other walls. The rays of the afternoon sun filter through branches that shade the exit of a gated mansion. Les Marquis de Ladurée on rue Castiglione specializes in just chocolate, and sails in with a cargo of chocolate macarons, chocolate tablets and unique chocolate gifts fit for modern day Marie Antoinettes. 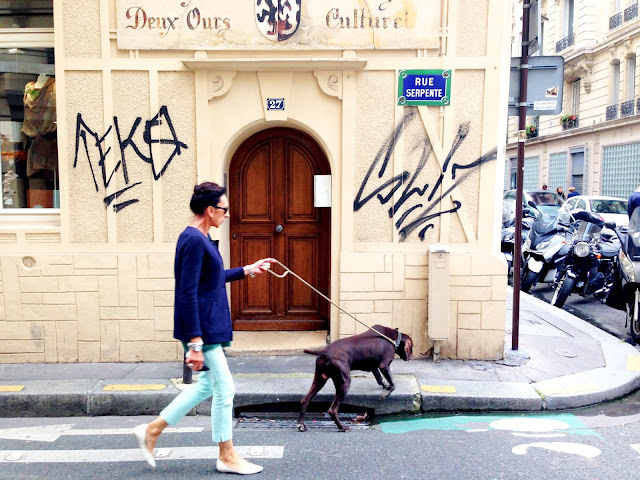 Gigantic lime green flower pots along the Seine brighten up concrete walkways. While trying to get a shot of this Parisian wine bistro, Vélib rent-a-bikes kept whizzing by. 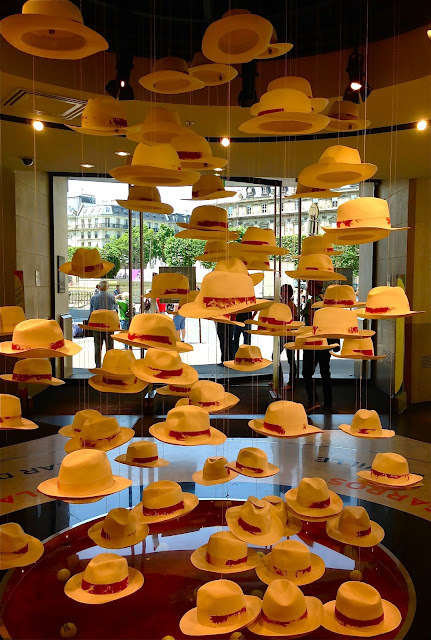 I liked this department store display of straw fedoras, still very much in season and perfect for sunny autumn sidewalk terraces. With most everyone back from summer vacation life resumes its rhythm. Here, a bicycle is parked in front of a window where inside, if you look closely, a sculpting atelier is going on. Today marks the annual rentrée scolaire, the first day of back-to-school. This larger-than-life sculpture represents Science. The "Bac S" or baccalauréat scientifique is the most revered course of pre-college study in France.